PDF display is broken in both Safari and Firefox. Most of my files have lost their proper application bindings. And my external SATA drives aren't working (apparently a known problem. So I can't connect to my Time Machine drive. So I can't even revert my Snow Leopard install. Time lapse video makes the fire look pretty gnarly. When you're as close as we are, it's every bit as ominous in real time. 6:45 AM, got about 4-5 hours of sleep. Woken up by the cat, who can tell that something is not quite right, and despite the fact that I'm yawning like George Bush at a Constitutional law class, I can't fall back asleep. LA Times still reporting that the only structure loss in the fire so far are three houses in Big Tujunga Canyon, which is in the middle of the Angeles National Forest. So all indications are that our house is still standing. But I have no idea whether the fire has burned itself out in our neighborhood, or is still working its way up the canyon. That's definitely the worst part of being evacuated, the not knowing. We're staying with some friends in Altadena. We had a great dinner here last night. The air was clear (one of the side-effects of being dry) and we had a spectacular view of the city lights. This morning it looks like a fog has descended, but it's not fog. It's smoke. The eastern flank of the fire is slowly working its way across the front range in this direction. And our friends' house is even more vulnerable than ours. It's a race against time between the fire and cooler weather which is supposed to arrive in the next few days. I swear by all that is holy that I will never again wish for more excitement in my life. [Update 10:00 AM] Our house is still standing, along with all the others in our neighborhood. The roadblocks have been removed, and a small army of firefighters are moving on to warmer climes. 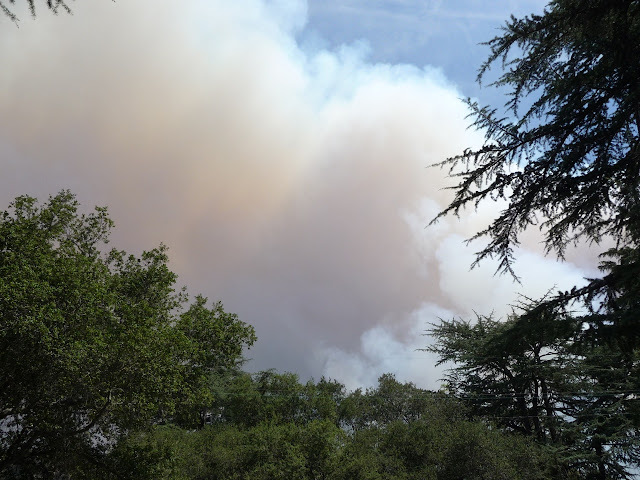 There's still some smoldering in the canyon, and today is going to be another scorcher so it's a little premature to breathe a complete sigh of relief, but it certainly appears that the worst is over. Tonight for the first time in my life I am involuntarily not sleeping in my own bed. We've been evacuated. This has been quite a day. The fire came in from the east and it was a real nail-biter for a while, but then they beat it back and I thought that was going to be the end of it. 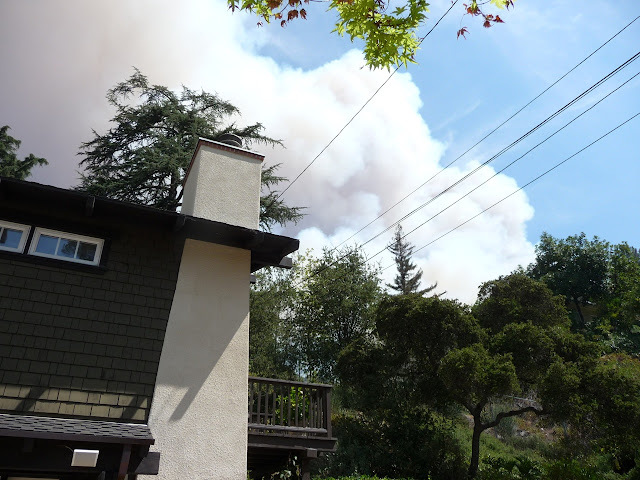 But then it jumped a fire line and is now creeping back towards our house from the north and west. It's coming in very slowly, and the fire fighters have been doing an amazing job of saving structures, so we have every reason to believe the house will be OK. But we don't know. It's tense, but things could be a whole lot worse. There's very little wind. We had plenty of time to prepare, so we managed to get a lot of stuff into our cars. We're together, uninjured, and we have a place to sleep (and shower!) Thanks to everyone who offered help and lodging. I'll write more about this tomorrow, but right now I am beat. It's about a quarter to ten and we're still here. Looks like we dodged the bullet. But that was as close as I ever want to get. Got about four or five hours of sleep. Not bad all in all, but I still feel like somethin' the cat dragged in. The air in our neighborhood is stagnant and thick with smoke. There is a thin layer of ash covering everything outside, and though our house is pretty well sealed, the smoke has started to seep in through the chimneys. (They are gas fireplaces, so they don't have regular flues that you can close.) We had to abandon the mater bedroom last night and sleep in the guest room because of the smoke (note to self: never build a house with a fireplace in a bedroom), but I'll take a smoky house over a burned-down one any day. An acquaintance of ours lost his house to a brush fire a few years back. He was a volunteer fireman, so he knew all the right things to do, and he did them all, and he still lost his house. It turns, unsurprisingly, that it's all about the wind. If the wind is blowing a brush fire in your direction you are absolutely fucked. So I am profoundly grateful for the stagnant air. This could have been much, much worse. [Update at 10:15] Seems I may have spoken too soon. I just turned on the TV. The fire is apparently still heading closer to town. 800+ homes have been evacuated, presumably in the neighborhoods just east of us. So it's not over yet. Ironically, the best coverage of the fire is on the local Fox News station, and it's none too good. It's amazing how much TV news reporters can talk and how much footage they can show without conveying any actual information. But every now and then they pull out into a wide shot from a helicopter that shows us exactly where the fire is, which is, of course, the main thing people want to know. Someone needs to figure out a way to track a fire in real time. [Update at 11:00] The latest info from the LA Times seems to indicate that the fire is moving north, which is to say, away from us. The official word as of 6AM was "no structures immediately threatened." Believe it or not, that's looking a whole lot better than it has for the last eighteen hours or so. [Update 3:20PM] It has been a tense afternoon as the fire moved east to west across the ridge behind our house, but it now definitely looks like it will pass us by. Weather conditions seem to be improving a bit as well. I'm starting to relax a little. Thanks to everyone who called and emailed to express their concern and offer help. It was very much appreciated. 1. There are no global lexicals. 3. There is no way to declare a global variable without also making the name of the variable pervasively special. In other words, once you've created a global variable named X it is no longer possible to write new code that creates lexical bindings for X. It is, of course, still possible for code evaluated before X was declared special to create lexical bindings for X. IMHO this is just insane. The only reason for this design is for backwards compatibility with code written for dynamically scoped dialects of Lisp. Well, guess what, folks. It's 2009. There are no more dynamically scoped dialects of Lisp. (Well, there's eLisp, but it lives safely sequestered in its own world and can be safely ignored by rational people.) And if you're still unconvinced that Common Lisp's pervasive special declarations are a bad design, consider the rule that all global variables should have named that are bookended by asterisks. Any time you need to impose a rule like that on your programmers, your language design is broken. Fortunately, the situation is not all that hard to remedy. All that is needed is to implement the hypothetical L-LET and D-LET constructs from the Idiot's Guide, and to provide a way to declare global variables in a way that doesn't make them globally special. "Defines VAR to be a global dynamic variable with initial value VAL"
"Returns the current dynamic binding of VAR, even if there is a lexical binding in scope"
"Unconditionally create new dynamic bindings"
"Immutably binds VAR to VAL. If FORCE-REBIND is T then VAR is forcibly rebound." "Defines VAR to be a global lexical variable"
"Unconditionally returns the global lexical binding of VAR"
> While executing: (SETF NON-SETTABLE-VALUE), in process Listener(6). "Can rebind a constant by specifying FORCE-REBIND"
2. Constants are enforced to be immutable unless this is explicitly overridden by specifying FORCE-REBIND to be true. 3. Because the design is orthogonal, it is actually a design choice whether dynamically binding a global lexical should be an error. There is no reason why this couldn't be allowed to proceed, to create a dynamic binding that could then be accessed (only) via the DVAL macro. But I decided that although it's possible to have both global lexical and dynamic bindings for the same variable at the same time, it's probably not a good idea. There is a long-standing problem in physics concerning the flow of time. All known physical laws -- except one: the second law of thermodynamics -- are "temporally symmetric" that is, they operate equally well whether time is flowing forwards or backwards. Take a movie of any physical phenomenon and run it backwards and everything you see will be consistent with physics. But the Second Law is not really a fundamental law, it is just the statement of the empirical observation that time seems to flow in one direction and not the other, so the deeper question of why this should be so has remained a mystery. This result has recently been (re)discovered by a card-carrying physicist. It's really starting to annoy me how many physicists get press by making these kinds of "breakthroughs". All this stuff was figured out in the mid-90's. You'd think that now nearly fifteen years on the word would have gotten out, but it hasn't. It's really kind of weird. I seriously doubt that there's a conscious QM Mystery Conspiracy, and yet here we are. Why people should still be scratching their heads about the arrow of time and "spooky action at a distance" in 2009 is the biggest mystery of all. So says Michael Ruse. I'm not sure I'd go quite so far as "disaster", but I certainly sympathize with the general sentiment. Fate seems to be sending me a pretty clear message that my life's destiny lies in moderating discussions on the merits of CSS (240 comments and counting). Despite the fact that the argument seems to be going around in never-ending circles, and I've made several attempts to shut the discussion down, it just doesn't seem to want to die. When the market sends such clear signals, the thing to do is to ramp up production to meet demand. Hence, another essay on Tables vs. CSS. Pardon me a moment whilst I don my asbestos suit. Whenever an argument among otherwise reasonable people turns intractable it is usually because both sides have overlooked something really fundamental, and I think this is the case here. The fundamental thing that both sides have overlooked in this case is that HTML is (or at least should be considered) object code. Let me explain what I mean by that. Is that source code or object code? In other words, is that code that a coder writes, or code that a compiler emits? Hopefully by now you realize that the answer is: it can be both. IMHO, no one should ever write any HTML by hand. HTML should be considered exclusively as object code, except for the most simple of quick-and-dirty hacks. The idea that HTML can (or even should) be considered source code is the root of many evils on the Web. The right way to create web pages is by building higher-order abstractions in a programming language (preferably functional ones, but I'm not dogmatic about that). There is only one argument for using CSS for layout that this approach does not completely demolish, and that is accessibility. CSS advocates argue that tables impede the rendering of web content for non-visual media. I think that's debatable, but even if it's true, it's irrelevant because there is no reason why the same content has to be rendered the same way on the server for all clients! This again assumes that HTML is source code, and you so you don't want to have different HTML for different clients because that would make extra work and violate the DRY (don't-repeat-yourself) principle. But HTML need not be source code. The source code can be a higher-level representation, and that higher-level representation can be rendered in different ways for different clients. For example, imagine a world where the client said to the server, "Give me web page FOO, and oh by the way, my user is blind" and what came back from the server was not HTML at all but an audio file. Now blind users wouldn't even need a special client! All they would have to do is configure a standard browser with a custom header to indicate blindness, and they're off to the races.